Small Fishing Boats Smuggle People To California More illegal immigrants are crossing the U.S. and Mexico border by sea. As law enforcement cracks down on the risky sea journeys, immigrant smugglers are taking their contraband loads even farther up the coast of California, sometimes hundreds of miles from the border. 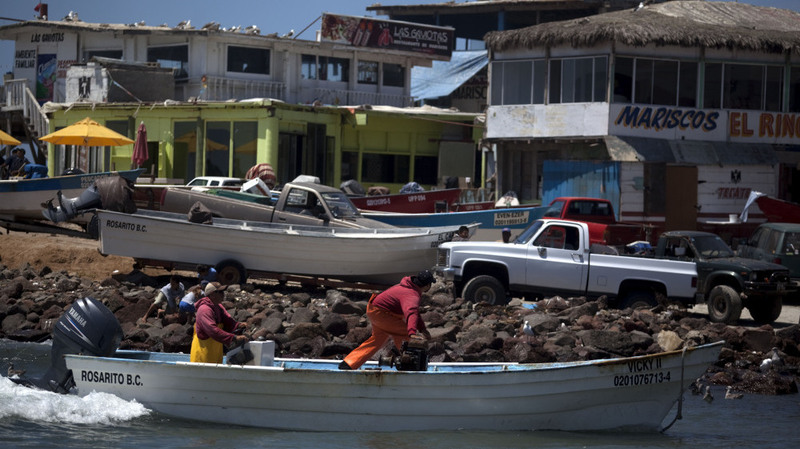 Fishermen and visitors gather at the beach in the village of Popotla, Mexico, some 15 miles south of the U.S.-Mexico border, in July 2010. Illegal immigrants are increasingly looking to the ocean, as they consider crossing overland more risky. Most mornings George Uraguchi grabs his paddle board and heads down a steep, secluded canyon in Palos Verdes, one of Los Angeles County's wealthier coastal communities. On one recent morning, though, his predawn excursion was interrupted by what he saw in the still water. "It was more than just debris," Uraguchi says. "I saw some life jackets, and when I looked a little bit closer, then sure enough there was an overturned boat out there." Uraguchi called 911, then hopped into the water and paddled out through the floating life jackets and bobbing fuel cans. "By that time the police had shown up, and they were up here on the trail and I yelled up to them and said, 'Hey do you want me to look for bodies?' and they said 'Yeah,' " Uraguchi says. He didn't find any. In fact, it was pretty clear everyone had made it to shore. Wet jackets, soaked jeans and shirts lined the path all the way up to the road. These guys got away, but over the past year, more than 600 people have been caught trying to sneak into Southern California by sea. The small boats, called pangas, are used in Mexico to fish. They are about 20 feet long, and with two or three outboard motors on back, a smuggler can take a load of up to 20 people far up the coast. This summer, illegal immigrants were found stranded in the ocean, more than a dozen were rescued after being abandoned on a nearby island. And one boatload even tried to come ashore during an international surfing contest. Some, however, don't make it at all. Armando Benitez Serafisco's nephew died last month in the waters north of San Diego County. From his home in Oaxaca, Mexico, he says losing his nephew, who was only 41, has been painful. Antonio Bonifacio Benitez lived in L.A. with his wife and three kids. He just recently went back to Mexico to bury his mother. His uncle says Bonifacio tried three times to illegally cross back into the U.S. over land but was caught every time. So he decided to pay $9,000 for the boat trip. He was found lying face down, dead in the boat when it washed ashore. In Orange County, more than 100 miles from the border, two local sheriff deputies are on the lookout. They take their harbor patrol boat out of the marina and into the ocean. Once 2 miles out, they slow the engine, shut the lights and wait. "We are just going to troll out here until we either see something on the radar or we get a call that somebody has seen something," Sheriff's Deputy Josh Baugh says at a little past midnight. He says nothing usually happens until dawn. Then all of a sudden, a panga pops up and heads to shore. His partner, Nick Wray, says 46 miles of coastline is a lot to cover with one boat. "We only know about the ones that we are catching. Who knows about all the other ones that we are missing?" Wray says. But they're not the only ones partnering in this new battle along California's coastline. At the massive Port of Long Beach, the Border Patrol has set up shop inside the command center to better coordinate with local agencies. In a large conference room, huge screens project radar images of every craft near the port. "We're taking the fight to where we need to take it," says Supervising Agent Steve McPartland. "There is no doubt about it." But back in Palos Verdes, resident George Uraguchi, who stumbled on a smuggler's overturned boat, says he doesn't believe the Border Patrol has a handle on the increased smuggling by sea. "I don't know what we have a Border Patrol for," Uraguchi says. "I'd rather get my money back or get some sort of a tax break because, you know what? They are useless." He wants more done to secure the border so his quiet cove and community remain just that way.